Food Adventures of a Comfort Cook: A Skillet Dinner doesn't always need the creamed soup. A Skillet Dinner doesn't always need the creamed soup. I was feeling a bit down and angry all weekend, so wanted something quick to make for dinner, but comforting too; a one pan to make, one bowl to eat out of type of meal. I had just purchased boneless, skinless chicken breasts on sale, but again, didn't want the same old, same old of potatoes or stuffing. Actually, I wanted rice because I thought it would be a fun change. Rice is fun, especially if you try eating it with chopsticks; trying to do the ultimate challenge of picking up one grain; but I digress. 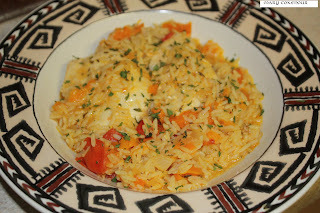 Ok, so chicken and rice, but I didn't want the same old recipes; no stir fry, no casserole that entailed using cream of "something" soup and cheese; I was so bored with all that. I swear, I believe I do some of my best creations when I'm surrounded by negative energy. Times like these, Roy knows to stay out of the kitchen; I'm in the zone and don't mess with me, unless you want to end up on the cutting board. What he couldn't believe was that I could come up with a recipe, prep, cook and serve it all in less than an hour. Yeah, sometimes I surprise even myself, so here you go, Skillet Chicken and Rice without the creamed soup. 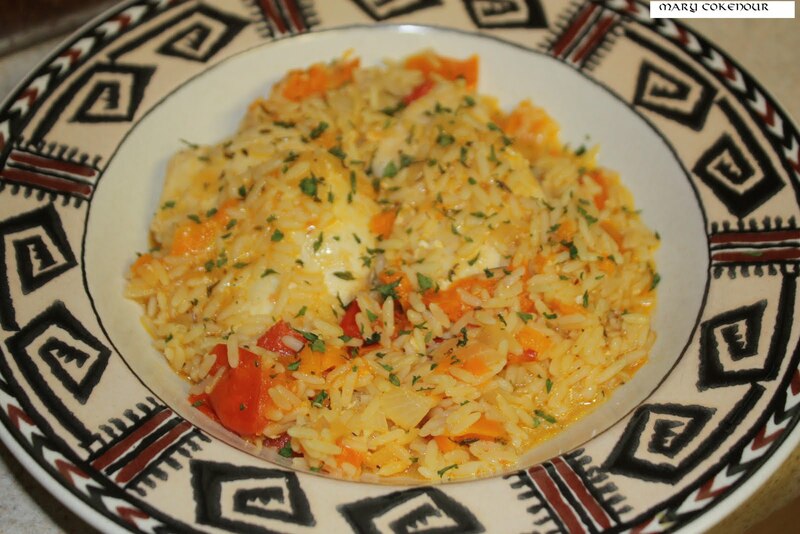 The chicken is moist and tender; the seasonings enhance and bring together the veggies with the rice and chicken. In large skillet, heat oil on medium-high heat; season chicken with salt, black pepper and garlic powder; brown chicken on one side. Flip chicken over to brown other side, but add in diced bell pepper and onion to sauté as chicken browns. Add tomatoes, turmeric, thyme, rice and chicken broth; bring to boil and let ingredients boil for 10 minutes before reducing heat to low. Cover and let cook for additional 20 minutes, or until rice has absorbed broth and is tender. Garnish each serving with sprinkled parsley.